In the historical center of Bogotá it is located El Yarumo Hostel. As its name indicates, it is a Hostel where people from all around the world are more than welcomed. We have an open minded mentality so that is why that we conceive this hostel not only as a place to rest, but in particular a meeting point and a melting pot of young people. So, our two main characteristics are the national diversity and the youth, that 's why we are always organising events and parties in our common facilities, to put together these two elements. We are located in the Candelaria Area. From this quarter, you will take advantage of an incredible view of the mountains and especially of the Monserrate. 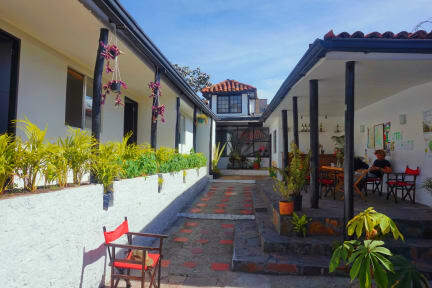 Located in the middle of La Candelaria, it is perfect to enjoy the most of the historical center. You are at 2 minuts of the best restaurants (included vegetarian restaurant), theaters and bars! This hostel is peaceful, unique for its large patio, bright light and its hundreds of plants that make you appreciate its calm and tranquility. El Yarumo Hostel is a modern hostel, which offes both dorms and private bedrooms. Furthermore, we have excellent common areas where the travellers can meet and get together in order to exchange thoughts and experiences. We also have a bar service, where our guests will be able to relax after a long day of travelling. And of course, we have Wi-Fi. El Yarumo Policies and Conditions. Check in at 14:00 . It's a normal hostel, not really special but nothing really bad about it. The staff is lovely and helpful (Thanks Sofia, Sol, Pierre and Esperanza). Actually for the private room I stayed it was a little bit overpriced. The room was located between reception and kitchen, so it was very noisy and I could hear the doorbell ringing too loud during the night. Besides that, the room was very cold, with only one blanket. For the shared ones its a good value for the money, I guess. Nice showers!